At a recent beekeeping meeting the question was asked if a split can be made to help control Varroa. The answer is yes, and the reason is Varroa’s dependence on developing bee larvae. 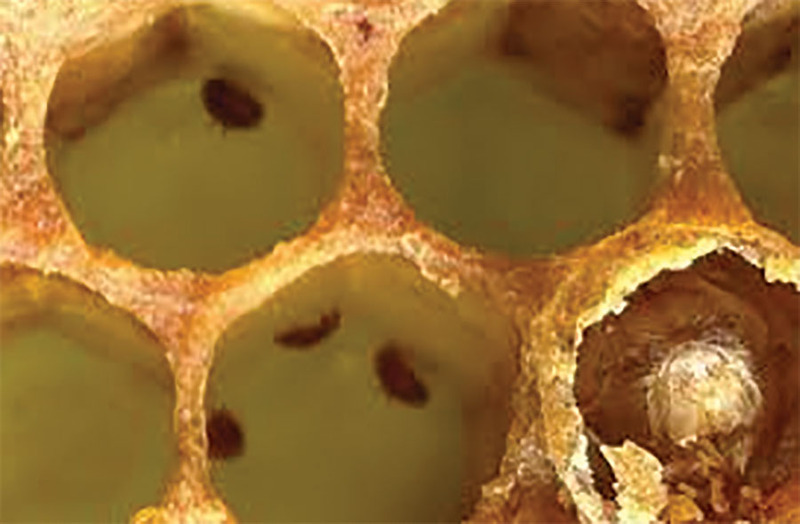 Varroa can only reproduce by entering a cell containing a mature larva ready to be capped. 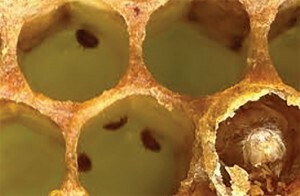 Once the cell is capped, Varroa begin to reproduce. They feed on the developing pupa’s hemolymph vectoring viruses and ultimately weakening the emerging bee. This cycle then repeats for as long as there are larvae for Varroa to infest. Since more than one mature Varroa will emerge with a single adult bee, eventually the varroa population can overrun the bee population and the colony’s viral load will cause extensive disease and ultimate collapse. Depending on the initial level of infestation, this can happen in as short an interval as a single season. There are many ways to make splits and almost an equal amount of reasons why beekeepers make them. In this article I’ll discuss splits made with the intent to control Varroa-using manipulations to temporarily stop the colony from producing bee larvae and therefore providing control of the Varroa population. This means the split must go through a period when no eggs are being laid either because it’s in transition to a new queen or the existing queen is being restricted from laying. This is referred to as a brood break, or broodless period, and must be of sufficient duration to deny mites the opportunity to reproduce for an extended period. During the broodless period all the reproducing mites, already under capped cells, will emerge and with no available larvae to continue reproduction some will die and others will be groomed off. Since the population is diminished, once the brood cycle resumes the emerging bee population can grow faster than the Varroa population. 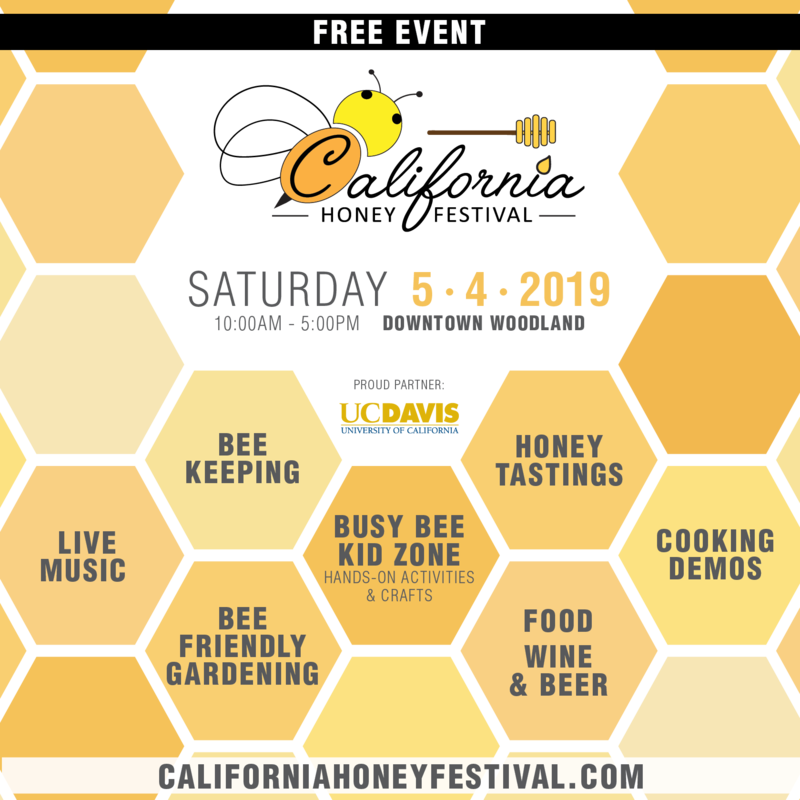 This has been described as a forever-young colony where periodic brood breaks allow bee populations to naturally out-run their pathogens and pests. The model in nature is the African honey bee that constantly swarms and absconds re-starting their brood cycle each time. With a split, accompanied by a brood break, there are a few important considerations. The colony looses a great deal of population and the split must be timed to allow recovery before the end of the season. Also, facilitating a successful brood break requires understanding the brood cycle. The splits must be re-queened, but egg laying must be delayed. How you introduce a queen will depend on the resources you have, or can obtain, at the time of the split. Here are some examples of how to re-queen and at the same time facilitate a brood break. A walkaway split where a colony raises an emergency queen. Timing the introduction of a virgin queen using a ripe queen cell. Timing the introduction of a purchased fertile queen. Using walkaway splits will depend on having brood frames with eggs so the splits can draw queen cells and raise emergency queens. If all goes smoothly, raising a new egg-laying queen will take about 27 days. It will take another 21 days, or about seven weeks total, before the colony has an emerging population of new bees. For the first nine to 10 days after the split, Varroa can still find open cells with mature larvae to reproduce but after that all existing larvae will be capped. While the current brood cycle finishes, Varroa will continue to emerge with adult bees but are denied larvae to reproduce until about day 34. At that point the new queen’s larvae will mature and Varroa can resume reproduction. The 25-day period, between day nine and day 34, is the start of the Varroa population decline that will become evident in future Varroa measurements. The main advantage of a walkaway split is that it can be done without the timing restrictions of acquiring new queens or queen cells. This option works best around swarm season with good nectar flow and plenty of available drones. A walkaway also allows time for additional Varroa controls when all the mites are out of cells and on bees. That window is difficult to predict, but can occur starting around day 24 and can last about 10 days. That’s the sweet spot for optional additional treatments. Inspections can help determine exactly when all the old brood has emerged and when new brood is first available to mites. 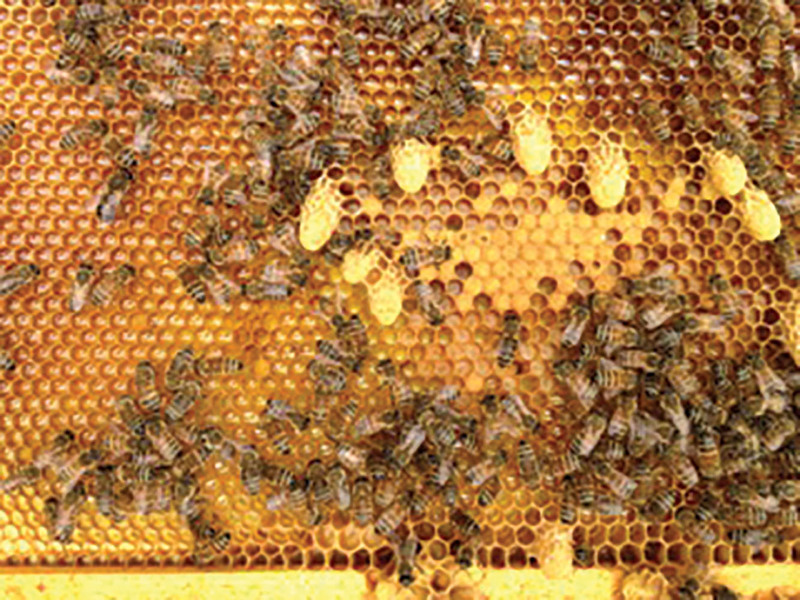 A delayed introduction of a ripe queen cell provides a similar brood break. With this mehod the queen in the cell is only a day or two from emerging. Assuming the split is eggless, with no opportunity for emergency queen development, you can leave the split queenless for about 10 days then install the ripe cell. A few days later the virgin emerges and a few days after that she begins mating flights. By delaying the introduction of the queen cell, the events inside the colony follow the timing of a walkaway split with all the same benefits. The advantage of using a queen cell is your choice of queens. If you’re doing this during swarm season, you can use your own swarm cells from colonies that have characteristics you want, or you can purchase desired cells from local queen breeders. Since the queen-cell splits must be ready before the cells arrive, timing is critical. You want your splits done and waiting for about 10 days previous to the arrival of your ripe queen cell. During the 10-day period prior to introduction of your queen cell it’s critical there are no emergency queen cells in production by the colony. Emergency cells are normally started within a day or two. Check a few days after the split and if you encounter emergency queen cells you must remove the frame, shake or brush off the bees, destroy all the emergency cells and put the frame back. Then before installing the ripe queen cell check for emergency cells again and repeat the procedure above if needed. It’s imperative that you’re only allowing the queen you want to emerge. 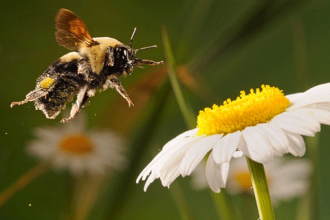 Unlike the parent colony queen, new queens must be introduced to the colony slowly allowing their pheromone to permeate and facilitate acceptance. The technique is the same, meaning you must delay the introduction long enough to facilitate a brood break. Just like with ripe queen cells, there are the same critical timing issues and colony behaviors to consider. If the split had eggs, the colony will start emergency cells almost immediately. Those will need to be removed as explained previously. If no emergency cells are present, you can simply leave the split queenless for few days, then introduce the new queen in her cage with the cork in place denying access to the candy plug normally used to release the queen. After a few days you can remove the cork and expose the candy plug. It takes about three to five days until she’s released and another five, or more, until she starts laying. In all cases, the parent colony queen will continue to lay without a brood break unless you intervene. One way to accomplish a brood break is to capture her and leave her in the colony but restrict her laying to a very small area under a “push in cage.” These cages are generally about four inches square made from #8 hardware cloth and deep enough so the queen has room and can be attended by workers. Another way is to install a commercially available queen release frame and leave her in the frame. Either way her physical presence in the colony will maintain some order and you can leave her caged until all the existing brood has emerged. 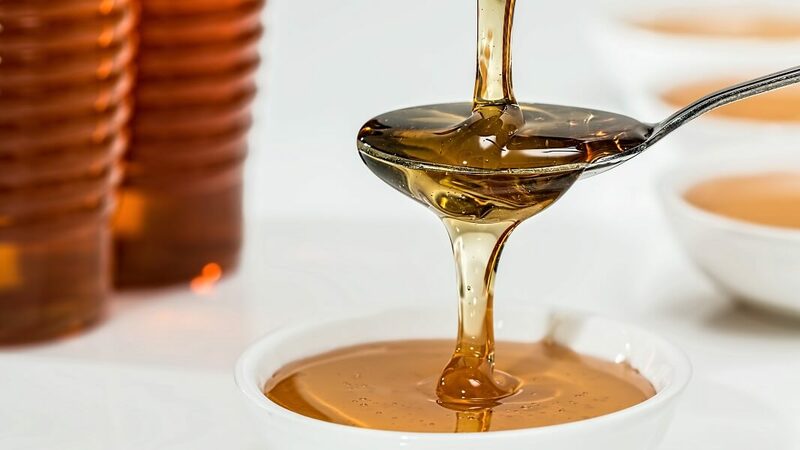 To help decide, start with an inspection and determine the number of splits you can make based on the quantity of nurse bees, brood and food frames that are available. Choosing an option, like queen cells, or new fertile queens will depend on connecting with a supplier and timing the splits with delivery. During swarm season you can use your own swarm cells and, as mentioned, a walkaway can be done almost spontaneously as long as drones are available to mate the virgin queen. 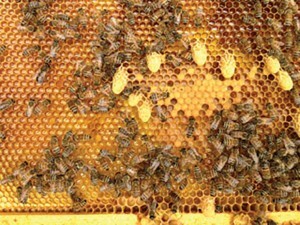 Emergency cells are removed in splits where a new queen is introduced, but allowed to emerge during a walk away split. All the options require inspections to determine if the queen is accepted and laying. When re-queening doesn’t happen according to plan, you must intervene to get the colony on a path to becoming queenright. Leaving a colony without a queen, for an extended period, will result in worker bees developing their ovaries and when that happens workers will start laying eggs. A colony of laying workers produces all drones and the colony is basically doomed. Also, if your virgin queens from queen cells or walkway splits are not mated correctly they can also lay all drones and must be replaced. The weather plays a major role in the mating of virgin queens and can also delay your planned date for doing splits. 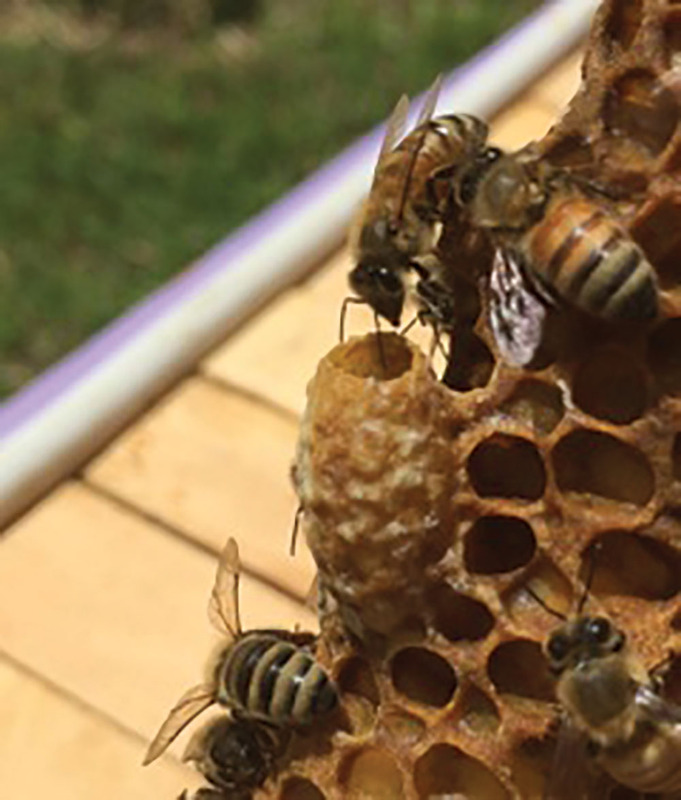 Queens will emerge from cells on their schedule regardless of weather, so you may need to think about how you would care for virgin queens in case weather prevents you from getting cells into colonies before they emerge. Since these splits are for the purpose of Varroa control, monitoring mite populations before and after is critical to understanding efficacy. 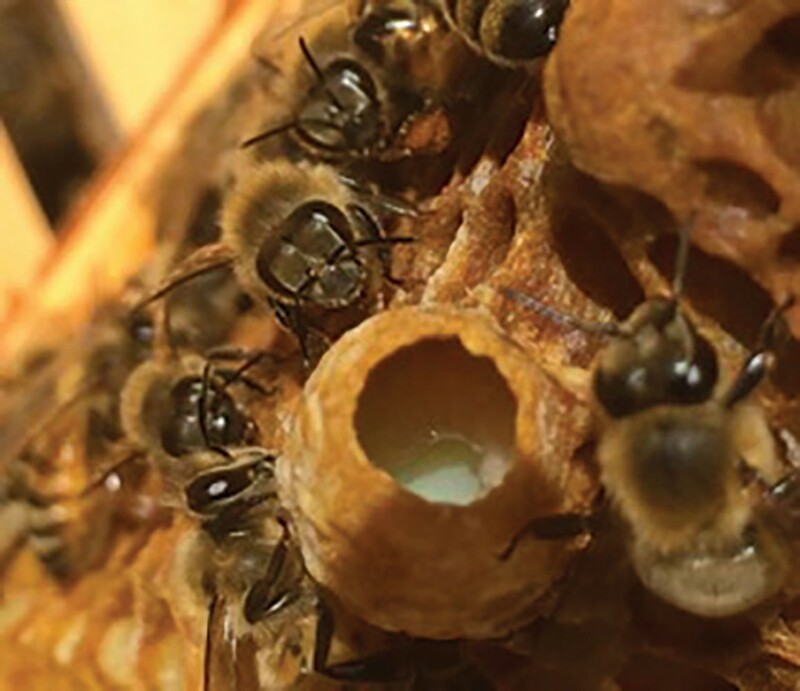 If your ultimate goal is limited treatment, your requeening choice should favor queens with hygienic behavior that resist Varroa or, conversely, bees that can tolerate higher levels of infestation. When using walkaway splits or ripe queen cells, area drones will determine part of the genes passed on to the splits. The hygienic quality of locally mated queens can only be determined as you monitor Varroa counts. Also, you will loose queens that you purchased for their hygienic traits if they swarm and her daughter queens may produce workers with different traits because they will mate with local area queens of unknown genetics. A realistic goal is to achieve a balance between infestation and a healthy colony. 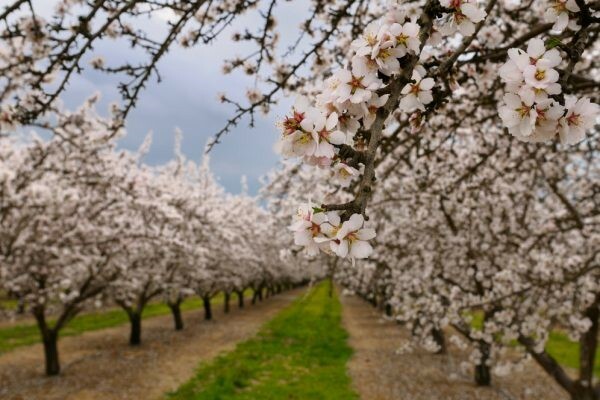 Realizing it will not be possible to eliminate all Varroa, or to ignore them hoping the bees will deal with them on their own, is the first step toward successful Varroa control. Day-24 All mites are phoretic until 7-8 days after the new queen starts laying. William Hesbach is a sideline beekeeper in Cheshire CT.